IFN-β-1a has been used over the past 15 years as a primary therapy for relapsing-remitting multiple sclerosis (MS). However, the immunomodulatory mechanisms that provide a therapeutic effect against this CNS inflammatory disease are not yet completely elucidated. The effect of IFN-β-1a on Th17 cells, which play a critical role in the development of the autoimmune response, has not been extensively studied in humans. We have investigated the effect of IFN-β-1a on dendritic cells (DCs) and naive CD4+CD45RA+ T cells derived from untreated MS patients and healthy controls in the context of Th17 cell differentiation. We report that IFN-β-1a treatment down-regulated the expression of IL-1β and IL-23p19 in DCs, whereas it induced the gene expression of IL-12p35 and IL-27p28. We propose that IFN-β-1a-mediated up-regulation of the suppressor of cytokine signaling 3 expression, induced via STAT3 phosphorylation, mediates IL-1β and IL-23 down-regulation, while IFN-β-1a-induced STAT1 phosphorylation induces IL-27p28 expression. CD4+CD45RA+ naive T cells cocultured with supernatants from IFN-β-1a-treated DCs exhibited decreased gene expression of the Th17 cell markers retinoic acid-related orphan nuclear hormone receptor c (RORc), IL-17A, and IL-23R. A direct IFN-β-1a treatment of CD45RA+ T cells cultured in Th17-polarizing conditions also down-regulated RORc, IL-17A, and IL-23R, but up-regulated IL-10 gene expression. Studies of the mechanisms involved in the Th17 cell differentiation suggest that IFN-β-1a inhibits IL-17 and induces IL-10 secretion via activated STAT1 and STAT3, respectively. IFN-β’s suppression of Th17 cell differentiation may represent its most relevant mechanism of selective suppression of the autoimmune response in MS. Multiple sclerosis is an inflammatory demyelinating CNS disease, in which the autoimmune response is presumably directed against CNS myelin proteins. One of the hallmarks of the disease process is that the otherwise impermeable blood-brain barrier permits peripherally activated inflammatory cells to migrate into the CNS. During the episodes of disease activity, autoreactive T cells migrate into the CNS perivascular areas, where they upon reactivation with abundant myelin Ags lead to demyelination and axonal degeneration. The chronic inflammatory response leads to the neuronal conduction deficits associated with neurological symptoms and eventually to the loss of functional neuronal tissue and astrocytic gliosis, in which sclerotic plaques replace the functional neuronal tissue. Suppression of the inflammatory response, which leads to the prevention of CNS lesion formation, has been an effective therapeutic approach leading to the inhibition of disability progression in a large proportion of relapsing-remitting (RR)3 multiple sclerosis (MS) patients. IFN-β-1a has been used over the past 15 years as a first-line treatment for RR MS. Its efficacy has been documented in large placebo-controlled clinical trials by a significant decrease in the clinical relapse rate and new CNS lesion formation documented by the magnetic resonance imaging (1). Despite its established therapeutic efficacy, IFN-β’s complex mechanisms of action are not yet completely elucidated. Previous in vitro studies have suggested that the beneficial effects of IFN-β-1a in MS are due, at least in part, to an antiviral effect, the inhibition of APC maturation and T cell proliferation, the regulation of IL-12 and IL-10 cytokine transcription (2), and the blocking of cell transmigration through the blood-brain barrier (3). However, recent advances in our understanding of the development of the autoimmune response may allow us to identify novel mechanisms of action for this effective therapy. The Th17 cell lineage is thought to play a critical role in the development of the autoimmune response in rheumatoid arthritis, psoriasis, juvenile diabetes, and autoimmune uveitis (4, 5). Several studies have documented the accumulation of Th17 cells in CNS MS lesions, suggesting that Th17 cells play a central role in the immunopathogenesis of MS (6, 7, 8). Lock et al. (7) have detected elevated IL-17 mRNA levels in active MS brain lesions in comparison to normal-appearing white matter and this was confirmed at the protein level by Tzartos et al. (8). Our recent study has identified an accumulation of Th17 cells in MS lesions, as evidenced by the increased expression of IL-17, retinoic acid-related orphan nuclear hormone receptor c (RORc) transcription factor, and multiple cytokines that mediate Th17 cell expansion (9). IL-17 gene expression is higher in the blood and cerebrospinal fluid mononuclear cells derived from MS patients than in those from healthy controls (HCs) (6). Similar to the other T cell lineages, the differentiation of Th17 cells is orchestrated by cytokines secreted by APCs. Although TGF-β and IL-6 induce Th17 cell differentiation in animal studies, this cytokine combination did not lead to the differentiation of human Th17 cells, which has required one of the following combinations: IL-6 and IL-23 (10), IL-1β and IL-6 (11), IL-1β and IL-23 (12, 13), TGF-β and IL-23 (14), or TGF-β and IL-21 (15). In contrast to mice, several human studies have reported that TGF-β even inhibits IL-17 synthesis (11). IL-23, which in mice only expands differentiated Th17 cells, is found to be a critical cytokine for Th17 cell differentiation in human studies (12, 13, 14, 16). Recently, Manel et al. (16) have demonstrated that a combination of all of these cytokines leads to the most effective differentiation of human Th17 cells. In this study, we identified that IFN-β-1a inhibited the expression of IL-1β and IL-23, while it induced the expression of IL-12p35 and IL-27p28 in the dendritic cells (DCs) derived from MS patients and HCs. Our DC supernatant transfer experiments confirmed that the IFN-β-1a-induced changes in DC cytokine secretion suppress the Th17 markers RORc, IL-17A, and IL-23R. 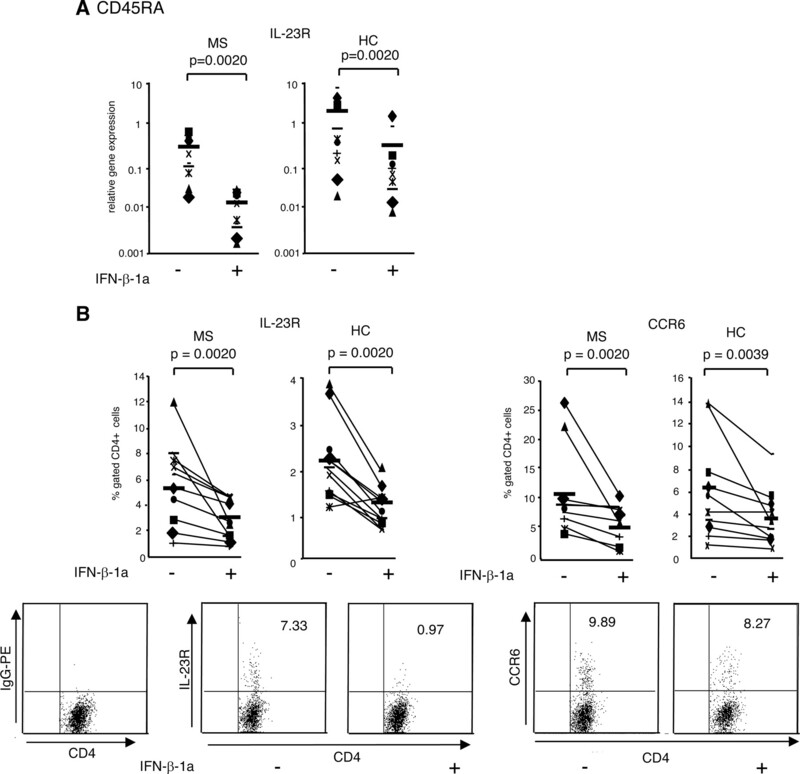 Furthermore, IFN-β-1a exhibited a direct effect on naive CD4+CD45RA+ T cells derived from both MS patients and HCs and inhibited their Th17 differentiation, as evidenced by the inhibition of RORc, IL-17A, and IL-23R expression. Peripheral blood samples were collected upon obtaining institutional review board-approved informed consent from 54 MS patients and 40 HCs. The patients were not treated with immunomodulatory therapy at the time of blood collection and their treatment-free period was as reported previously from our laboratory (10, 17). CD14+ monocytes were separated from PBMCs by negative selection using an EasyStep Negative Selection Monocyte Enrichment Kit (StemCell Technologies). DCs were generated from monocytes plated at 106 cells/ml in low adhesion plates (Corning) in RPMI 1640 complete medium supplemented with 10% FBS, 2 mM glutamine, and 100 U/ml penicillin G, and streptomycin (Invitrogen) in the presence of GM-CSF (1000 IU/ml) and IL-4 (500 IU/ml; R&D Systems). At day 6, the cells were stained for the expression of CD11c+ (BD Pharmingen) and DC purity (>95%) was confirmed by flow cytometry. LPS-matured DCs were cultured in the absence or presence of IFN-β-1a for 6 h before the RNA isolation with an RNeasy kit (Qiagen). CD4+CD5RA+ T cells were separated from the PBMCs using magnetic beads negative selection (>95% purity; Miltenyi Biotec) and stimulated at 2 × 106 cells/ml with immobilized anti-CD3 (1 μg/ml, clone UCHT; R&D Systems) and anti-CD28 mAb (5 μg/ml, clone 28.2; BD Pharmingen) in Th17-polarizing conditions (IL-6 at 50 ng/ml and IL-23 at 10 ng/ml; R&D Systems) (10) in the absence or presence of IFN-β-1a (1000 IU/ml; R&D Systems). On day 3, the cells were collected for gene expression assays. The remaining cell cultures were expanded after 5 days with IL-2 (100 U/ml) for an additional 7 days and restimulated with plate-immobilized anti-CD3 and anti-CD28 mAb. The supernatants (SNs) were collected at 48 h for cytokine measurement by ELISA, and the cells were used for surface marker staining or lysed for RORc, GATA-3, and T-bet Western blot analysis. For Western blot analysis of STAT1 and STAT3 phosphorylation, CD4+CD45RA+ cells differentiated for 12 days in Th17-polarizing conditions were restimulated with anti-CD3 and anti-CD28 mAb in the absence or presence of IFN-β-1a for 1 and 6 h.
The DCs were matured with LPS (100 ng/ml; Sigma-Aldrich) in the absence or presence of IFN-β-1a for 48 h before supernatant collection. IFN-β in the SNs was neutralized with 4000 IU/ml anti-IFN-β Abs (goat anti-human polyclonal Ab; R&D Systems) 2 h before SN transfer. IL-1β and IL-23 (R&D Systems) were added to the SN at 10 and 20 ng/ml, respectively. IL-12p35 and IL-27p28 were neutralized with blocking Abs (polyclonal goat anti-human IgG Abs; R&D Systems catalog no. AF2526) at 10 μg/ml. Anti-CD3 plus anti-CD28 mAb-activated CD4+CD45RA+ T cells were cultured with 250 μl of SN for 3 days before RNA harvesting for the gene expression assays. Total RNA isolated from DCs and CD4+CD45RA+ cells was reverse-transcribed to cDNA using an iSCRIPT cDNA synthesis kit (Bio-Rad). qRT-PCR was performed on an Applied Biosystems PRISM 7700 Sequence System. The primers for the 18S RNA, IL-1β, IL-23p19, suppressor of cytokine signaling 3 (SOCS3), IL-12p35, IL-27p28, RORc, IL-17A, IL-23R, and IL-10 were purchased from Applied Biosystems. Each sample was analyzed in triplicate. Relative gene expression was normalized against 18S RNA. Immature and LPS-matured DCs were plated at 106 cells per condition in the absence or presence of IFN-β-1a for 1 and 6 h before protein extraction, as indicated for the STAT1, STAT3, and SOCS3 blotting experiments. For detection of STAT1 phosphorylation, the DCs were pretreated with 20 μM fludarabine (FLUD; Sigma-Aldrich) for 1 h in OptiMEM medium and then matured with LPS in the absence or presence of IFN-β-1a for 1 h.
The CD4+CD45RA+ cells were cultured at 2 × 106 cells per condition with IL-6 and IL-23 in the presence or absence of IFN-β-1a for 5 days, expanded with IL-2 for an additional 7 days, and restimulated with immobilized anti-CD3 plus anti-CD28 mAb for 48 h for RORc, T-bet, and GATA-3 blotting. For Western blot analysis of STAT1 and STAT3 phosphorylation, CD4+CD45RA+ cells differentiated for 12 days in Th17-polarizing conditions were restimulated with anti-CD3 and anti-CD28 mAb in the absence or presence of IFN-β-1a for 1 and 6 h. The cells were lysed with radioimmunoprecipitation assay buffer containing 2.5 mM sodium pyrophosphate, 1 mM NA3VO4, and 1 mM phenylmethylsulfonyl fluoride (Santa Cruz Biotechnology). The cell lysates were resolved with 5–15% gradient SDS-PAGE (Bio-Rad) and transferred to polyvinylidene difluoride membranes. The membranes were blocked with 5% milk in TBS (20 mM Tris and 500 mM NaCl) and 0.1% Tween 20 at room temperature for 1 h followed by overnight incubation at 4°C with primary Abs against pSTAT1 (rabbit polyclonal Ab; Cell Signaling Technology) and total STAT1 (clone 9H2; Cell Signaling Technology), pSTAT3 (rabbit polyclonal Ab; Cell Signaling Technology) and total STAT3 (rabbit polyclonal Ab; Cell Signaling Technology), SOSC3 (rabbit polyclonal Ab; Santa Cruz Biotechnology); RORc (rabbit polyclonal Ab; Abcam), β-actin (clone Ac-74; Sigma-Aldrich), T-bet (clone 4B10; Santa Cruz Biotechnology), and GATA-3 (clone HG3-32; Santa Cruz Biotechnology). Secondary HRP-conjugated Ab was added at a dilution of 1/2000 for 1 h and the protein bands were detected with an ECL Detection System (Santa Cruz Biotechnology). Supernatants from the CD4+CD45RA+ cell cultures were collected and stored at −80°C until the cytokine measurements. IL-17A and IL-10 secretion was measured with ELISA kits from Antigenix America and BD Pharmingen according to the manufacturers’ protocol. IL-23R and CCR6 surface expression was measured by flow cytometry after CD4+CD45RA+ cell culture for 12 days in Th17-polarizing conditions in the absence or presence of IFN-β-1a and restimulation with anti-CD3 and anti-CD28 Abs for 48 h. The Th17-differentiated cells were stained with IL-23R-PE (clone 218213; R&D Systems), CCR6-PE Abs (clone 11AG; BD Pharmingen), and PE-conjugated mouse anti-human IgG isotype control (R&D Systems) and analyzed by FACSCalibur (BD Biosciences). Statistical analyses of the qRT-PCR, ELISA, and FACS results were performed using a Wilcoxon-matched pairs signed ranks test (GraphPad, InStat), followed by a Benjamini and Hochberg correction for multiple comparisons. Adjusted p < 0.05 were considered significant. Statistical analyses of gene expression in the CD4+CD45RA+ cells cultured with SNs from IFN-β-1a-treated DCs in the absence or presence of the indicated cytokines and blocking Abs were performed using a repeated measures ANOVA Friedman test with Dunnett’s posttest (GraphPad, InStat). A p < 0.05 was considered significant. First, we investigated the effect of IFN-β-1a on the cytokines that promote Th17 differentiation, IL-1β and IL-23p19. IFN-β-1a significantly down-regulated IL-1β and IL-23p19 gene expression in DCs derived from the 10 MS patients (−2.0- and −2.9-fold, respectively) and from HCs (−3.0- and −4.7-fold, respectively) in comparison to the untreated samples (Fig. 1⇓A). Recent studies from our laboratory have also detected that IFN-β-1a inhibits the secretion of IL-1β and IL-23 by monocyte-derived DCs from RR MS patients (18). To further characterize the mechanisms involved in the IFN-β-1a-induced changes in DC cytokine gene expression, we demonstrated that IFN-β-1a induces STAT1 and STAT3 phosphorylation in DCs derived from MS patients (Fig. 1⇓B). Since STAT3 activation induces SOCS3 expression (19), we examined to what extent IFN-β-1a induces SOCS3 gene and protein expression. Our results revealed a significant up-regulation in SOCS3 gene expression upon IFN-β-1a treatment of the DCs derived from the 10 MS patients (1.6-fold) and HCs (1.7-fold). The IFN-β-1a-induced SOCS3 up-regulation was confirmed at the protein level by using Western blotting (Fig. 1⇓C). IFN-β-1a inhibits IL-1β and IL-23p19 gene expression in DCs. A, IFN-β-1a inhibits the relative gene expression of IL-1β and IL-23p19 in DCs derived from MS patients and HCs. In brief, 106 DCs/ml derived from 10 MS patients and 10 HCs were cultured in the absence or presence of IFN-β-1a (1000 IU/ml) in a serum-free medium for 6 h. Relative gene expression was measured by qRT-PCR. The results are presented as relative expression to 18S mRNA on a logarithmic scale. Each symbol represents the average of triplicate results from an individual subject. A Wilcoxon-signed rank test was used to determine the significance of the differences between the untreated and IFN-β-1a-treated DC cultures, followed by a Banjamini and Hochberg correction for multiple comparisons. Adjusted p < 0.05 were considered significant. 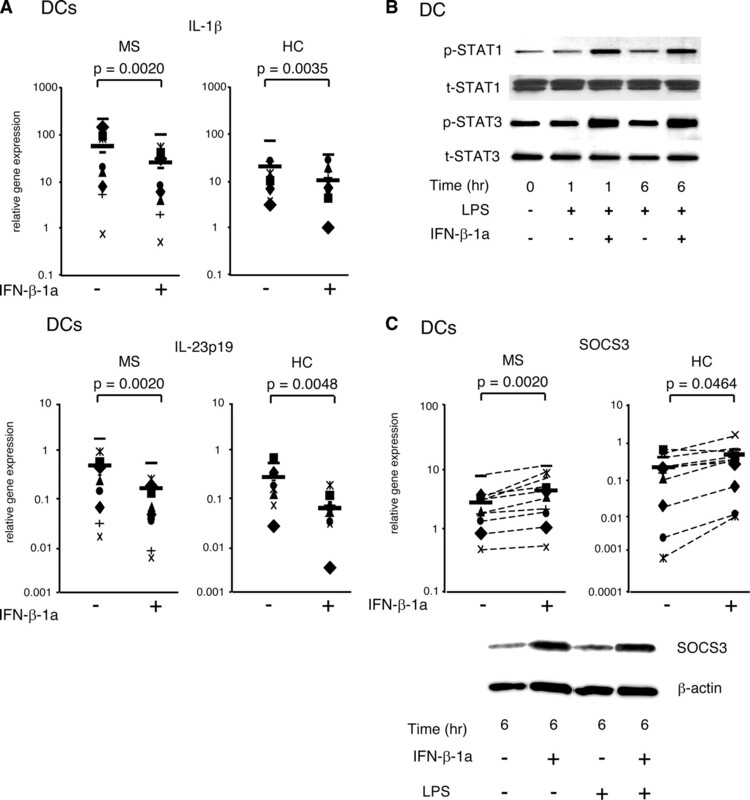 B, IFN-β-1a induces STAT1 and STAT3 phosphorylation in DCs derived from MS patients. Presented blot is representative of three similar Western blotting experiments. C, IFN-β-1a induces SOCS3 gene expression in DCs derived from MS patients and HCs. The results are confirmed at the protein level by Western blotting. This figure presents one of four similar blots. We next examined the effect of IFN-β-1a on DC expression of cytokines that inhibit Th17 cell differentiation, IL-12p35 and IL-27p28. IFN-β-1a significantly induced IL-12p35 gene expression in the DCs from 10 MS patients (11.7-fold), while the increase in HCs (1.3-fold) did not reach statistical significance. IFN-β-1a also induced IL-27p28 gene expression in both MS patients and HCs (527.5- and 335.7-fold) compared with untreated samples (Fig. 2⇓A). We next sought to characterize the signaling events that lead to the IFN-β-1a-mediated IL-12p35 and IL-27p28 gene transcription and demonstrated that, consistent with previous reports (20), IFN-β-1a induces STAT1 phosphorylation (Fig. 1⇑B). We further confirmed the role of IFN-β-1a-induced STAT1 phosphorylation in the regulation of IL-27p28 gene transcription (5) by using the STAT1-specific inhibitor FLUD. LPS-matured DCs were cultured with IFN-β-1a or IFN-β-1a plus FLUD and analyzed for STAT1 phosphorylation. We demonstrated that the IFN-β-1a-induced IL-27p28 expression was mediated via STAT1 phosphorylation, since IL-27 gene expression decreased in the presence of the STAT1-specific inhibitor FLUD (Fig. 2⇓B). Fig. 2⇓B shows one representative of three similar Western blots and average results of three qRT-PCR experiments performed in triplicate. IFN-β-1a induces IL-12p35 and IL-27p28 gene expression in DCs. A, IFN-β-1a induces IL-12p35 and IL-27p28 gene expression in DCs derived from both MS patients and HCs. 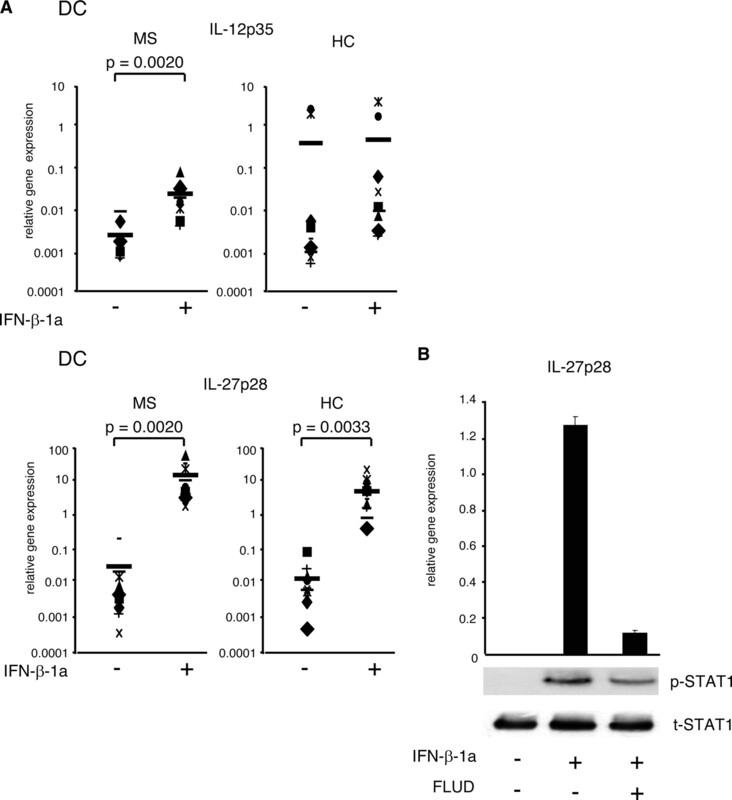 B, IFN-β-1a induces IL-27p28 expression in DCs via STAT1 phosphorylation. The DCs were treated with the STAT1 inhibitor FLUD (20 μM) for 1 h and matured with LPS (100 ng/ml) in the absence or presence of IFN-β-1a for 1 h before cell lysis for the Western blotting and for 6 h before the gene expression analysis. Presented relative gene expression for IL-27p28 is an average of three experiments performed in triplicate. The Western blot represents one of three similar blots. Because previous studies have reported that IL-1β and IL-23 induce and IL-12 and IL-27 inhibit Th17 cell differentiation (12, 13), we proposed that the IFN-β-1a-induced changes in cytokine gene expression in DCs might collectively inhibit Th17 cell differentiation. To test this hypothesis, naive CD4+CD5RA+ T cells derived from 11 MS patients were stimulated with anti-CD3 and anti-CD28 Abs and cultured with the SNs from DCs matured in the absence or presence of IFN-β-1a. Before the SN transfer, the IFN-β-1a added to the DC cultures was blocked with anti-IFN-β-neutralizing Abs as described in Materials and Methods. The SNs from IFN-β-1a-treated DCs inhibited Th17 cell differentiation, as evidenced by the significantly decreased expression of the Th17 genes RORc (−6.2-fold), IL-17A (−15.2-fold), and IL-23R (−3.1-fold) in comparison to the SNs from untreated DCs (Fig. 3⇓A). The inhibitory effects of the SNs from DCs treated with IFN-β-1a on the Th17 cell differentiation were reversed by the addition of IL-1β, IL-23, anti-IL-27 mAbs, or a combination thereof, as evidenced by an increased/reversed IL-17A gene expression (Fig. 3⇓B). Fig. 3⇓B presents the results of eight experiments performed in triplicate. A repeated measures ANOVA Friedman test was used to test the significance of difference between gene expression in CD4+CD45RA+ cells cultured with SNs from IFN-β-1a-treated DCs and SNs supplemented with the indicated cytokines and/or blocking Abs. Asterisks indicate p < 0.05. In summary, our results demonstrate that IFN-β-1a modifies the expression of multiple cytokines in DCs, which collectively inhibit the Th17 cells’ differentiation. IFN-β-1a-induced changes in DC cytokine secretion inhibit Th17 cell differentiation. A, IFN-β-1a-inhibited DC secretion of IL-1β and IL-23 and induced secretion of IL-12p35 and IL-27 collectively suppressed the Th17 cell differentiation. In brief, 106 DCs/ml derived from 11 MS patients were cultured in the absence or presence of IFN-β-1a in serum-free medium for 48 h. Exogenously added IFN-β-1a was neutralized in the SNs with anti-IFN-β Ab for 2 h before SN transfer. The negatively selected allogenic CD4+CD45RA+ cells were stimulated with plate-immobilized anti-CD3 (1 μg/ml) and anti-CD28 Abs (5 μg/ml) and treated with the DC SNs for 3 days before RNA extraction. RORc, IL-17A, and IL-23R gene expression was measured by qRT-PCR. B, The IFN-β-1a-induced changes in DC cytokine secretion inhibit Th17 cell differentiation, since the inhibitory effect is reversed by adding back IL-1β and IL-23 and blocking IL-27 or a combination thereof. The SNs derived from the IFN-β-1a-treated DCs derived from eight MS patients were supplemented with IL-1β (10 ng/ml), IL-23 (20 ng/ml), anti-IL-27 (10 μg/ml) Abs, or a combination thereof. SNs were transferred to allogenic CD4+CD45RA+ cells stimulated with anti-CD3 and anti-CD28 Abs, and the reversal of the inhibitory effect of IFN-β-1a-treated DC SNs on the IL-17A gene expression in T cells was detected using a repeated measures ANOVA Friedman test. Asterisks indicate p < 0.05. A direct effect of IFN-β-1a on Th17 cell differentiation was investigated by treating activated CD4+CD45RA+ T cells cultured in the presence of the Th17-polarizing cytokines IL-6 and IL-23. IFN-β-1a treatment inhibited RORc gene expression in MS patients (−2.2-fold) and HCs (−2.3-fold) (Fig. 4⇓A), while the gene expressions of T-bet and GATA-3 were not changed (data not shown). These results were confirmed at the protein level by Western blotting. Fig. 4⇓B presents one representative of three similar blots. IFN-β-1a directly inhibits Th17 cell differentiation. A, IFN-β-1a inhibits RORc gene expression in CD4+CD45RA+ T cells cultured in Th17-polarizing conditions. Two × 106 negatively selected CD45RA+ T cells derived from 10 RR MS patients and 10 HCs were stimulated with plate-immobilized anti-CD3 and anti-CD28 Abs under Th17-polarizing conditions (IL-6 at 50 ng/ml and IL-23 at 10 ng/ml) in the absence or presence of IFN-β-1a (1000 IU/ml) for 3 days. The gene expression of RORc was measured by qRT-PCR. B, IFN-β-1a inhibits RORc protein expression in naive CD4+CD45RA+ T cells cultured in Th17-polarizing conditions. CD45RA+ T cells were cultured under Th17- polarizing conditions for 12 for days in the absence or presence of IFN-β-1a and restimulated with anti-CD3 and anti-CD28 mAbs for 48 h. Total cell lysates were harvested and subjected to Western blotting. 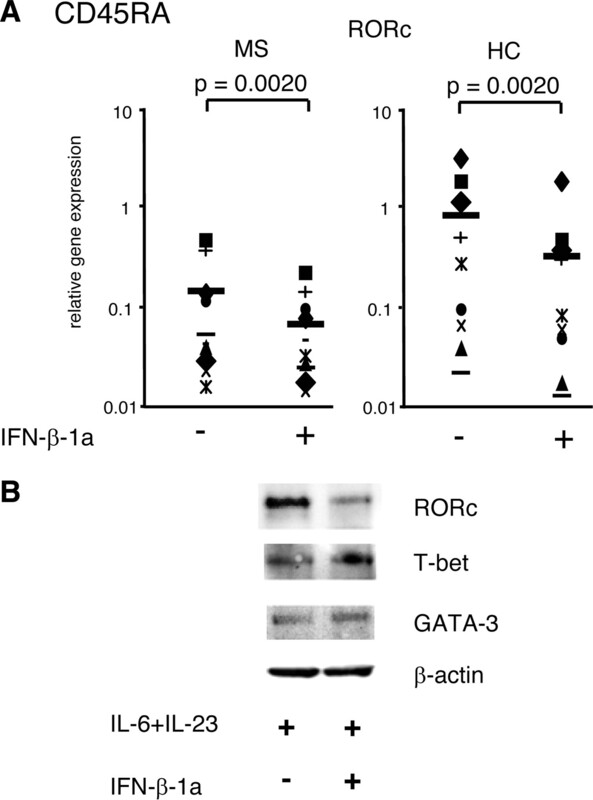 Membranes were immunoblotted with anti-RORc, anti-T-bet, and anti-GATA-3 mAbs. β-Actin was used as a control for protein loading. One representative blot of three is shown. Since RORc expression in humans, in contrast to mice, does not directly induce IL-17 cytokine secretion (21), we investigated the effect of IFN-β-1a on IL-17A production. IFN-β-1a inhibited IL-17A gene expression in the MS patients and HCs (−1.5- and −2.2-fold, respectively), as well as IL-17A protein secretion (−3.4- and −2.3-fold, respectively; Fig. 5⇓A). In contrast, IFN-β-1a up-regulated the IL-10 gene expression and the protein secretion in the T cells derived from the MS patients (3.7- and 1.5-fold, respectively) and the HCs (2.0- and 1.6-fold, respectively; Fig. 5⇓B). The gene expression and cytokine secretion of IFN-γ and IL-4 did not change (data not shown). In line with previous reports (22, 23), IFN-β-1a induced IL-12Rβ2 gene expression in the CD4+CD45RA+ T cells from MS patients, while the increase in HCs did not reach statistical significance (data not shown). IFN-β-1a inhibits IL-17A and induces IL-10 production in CD4+CD45RA+ T cells cultured in Th17-polarizing conditions. A, IFN-β-1a inhibits IL-17A gene expression and protein secretion in the CD45RA+ T cells derived from MS patients and HCs. IL-17A gene expression was measured by qRT-PCR at day 3, and IL-17A protein secretion was measured in the SNs collected after T cell culture for 12 days in Th17-polarizing conditions in the absence or presence of IFN-β-1a and restimulation with anti-CD3 and anti-CD28 Abs for 48 h. B, IFN-β-1a induces IL-10 gene expression and protein secretion in the CD4+CD45RA+ T cells derived from MS patients and HCs. C, IFN-β-1a induces STAT1 and STAT3 phosphorylation in CD45RA+ cells cultured in Th17-polarizing conditions. Two × 106 negatively selected CD4+CD45RA+ cells were cultured as above in Th17-polarizing conditions for 12 days, followed by restimulation with anti-CD3 and anti-CD28 mAbs in the absence or presence of IFN-β-1a for 1 and 6 h. Phosphorylated and total STAT1 and STAT3 proteins were detected by Western blotting. One of three similar blots is presented. 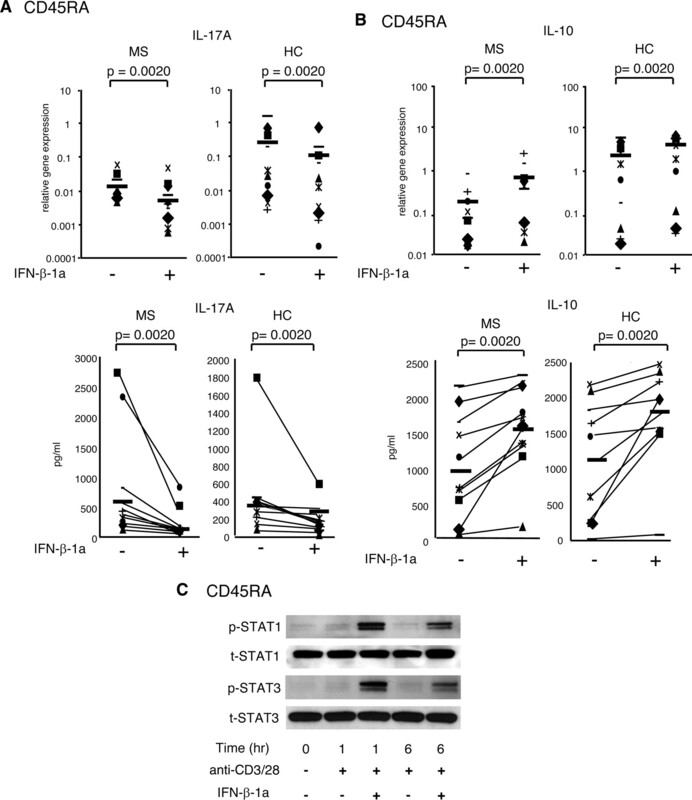 Studies of the mechanisms involved in the IFN-β-1a-medated inhibition of Th17 cell differentiation reveal that IFN-β-1a treatment of CD4+CD45RA+ cells cultured in the Th17-polarizing condition induces STAT1 and STAT3 phosphorylation (Fig. 5⇑C), which are implicated in the suppression of IL-17 and the induction of IL-10, respectively (24, 25), according to the previous animal studies. We next examined the effect of IFN-β-1a on the Th17 cell markers IL-23R and CCR6 (13). IFN-β-1a significantly decreased the gene expression of IL-23R in the MS patients (−2.8-fold) and the HCs (−5.8-fold) (Fig. 6⇓A). The expression of IL-23R and CCR6 was confirmed at the protein level by flow cytometry. The cells treated with IFN-β-1a had a significantly decreased surface expression of IL-23R and CCR6 in both MS patients (−2.1- and −1.9-fold, respectively) and HCs (−2.1- and −1.7-fold, respectively). Fig. 6⇓B presents the results for IL-23R and CCR6 expression on the CD4+CD45RA+ cells derived from 10 MS patients and 10 HCs, as well as the representative staining for each surface marker. IFN-β-1a down-regulates IL-23R and CCR6 expression in CD4+CD45RA+ T cells cultured in Th17-polarizing conditions. A, IFN-β-1a down-regulates IL-23R gene expression in the CD4+CD45RA+ cells from MS patients and HCs. IL-23R was measured by qRT-PCR in as above-cultured CD45RA+ T cells derived from 10 MS patients and 10 HCs. B, IFN-β-1a inhibits IL-23R and CCR6 surface expression on the CD4+CD45RA+ T cells derived from MS patients and HCs. IL-23R and CCR6 surface expression was measured by flow cytometry after CD45RA+ cell culture for 12 days in Th17-polarizing conditions in the absence or presence of IFN-β-1a and restimulation with anti-CD3 and anti-CD28 Abs for 48 h. The results are presented as a percentage of the CD4+ gated cells; each symbol represents an individual patient. The dot plot diagram presents a representative staining. Recent studies in mice deficient for IFN-β (26), type I IFN receptor (IFNAR) (27), and the Toll-IL-1R domain-containing adaptor-inducing IFN-β molecule involved in its downstream signaling (28) have demonstrated an increased susceptibility to experimental autoimmune encephalomyelitis (EAE) due to the lack of endogenous IFN-β signaling. These findings point to the role of endogenous IFN-β in the regulation of the adaptive immune response through the suppression of Th17 cells. Our study has demonstrated that IFN-β-1a treatment decreases IL-1β gene expression in the DCs derived from MS patients and HCs. Moreover, the effect of IFN-β-1a-induced change in this cytokine production on Th17 cell differentiation was confirmed by adding back IL-1β to the SNs derived from IFN-β-1a-treated DCs, which reversed the SN suppressive effect on the Th17 cell differentiation (Fig. 3⇑B). The reversal of the IFN-β-1a-treated DC SN inhibitory effect on the Th17 cell differentiation, which was achieved by adding IL-1β, IL-23, and by IL-27 neutralization, indicates that multiple cytokines play complementary roles in Th17 cell differentiation. Studies reporting increased levels of IL-23p19 protein in acute MS brain lesions and a higher production of IL-23 by DCs from MS patients in comparison to those from HCs (29) are in agreement with animal studies demonstrating that neutralization of IL-23 or the lack of IL-23p19 gene expression completely ameliorated EAE (30, 31). We have demonstrated in this study that IFN-β-1a decreases IL-23p19 gene expression in DCs from both MS patients and HCs. The functional effect of the inhibited IL-23 production on Th17 cell differentiation was confirmed by SN transfer experiments, since adding back IL-23 reversed the suppression of the IFN-β-treated DC SNs on the IL-17A gene expression in the differentiated Th17 cells. Our findings are in accordance with a recent human study that reported decreased levels of IL-23p19 mRNA in the PBMCs from MS patients treated with IFN-β-1a (32). Next, we sought to identify the molecular mechanisms of IFN-β-1a-mediated inhibition of IL-1β and IL-23p19 production. IFN-β-1a induced a rapid phosphorylation of STAT3 in DCs, which acts as a transcription factor for SOCS3 (19, 33). In addition to the reported capacity of IFN-β-1a to induce SOCS3 (34), previous studies have reported that SOCS3 inhibits IL-1β (33, 35) and IL-23 (10, 36). Based on our results, we propose that IFN-β-1a suppressed IL-1β and IL-23p19 gene expression through the induction of SOCS3. Although multiple earlier studies proposed a central proinflammatory role for IL-12 in the development of the autoimmune response and studies of IFN-β mechanisms of action have reported that IFN-β suppresses IL-12p40 and IL-12p70 secretion (2), Cua et al. (31) have reported that IL-23 but not IL-12 is critical for the induction of EAE, since mice deficient for IL-12p35 and IL-12Rβ2 were highly susceptible to EAE (37). In line with the recently proposed immunoregulatory role of IL-12 in the control of the autoimmune response, Annunziato et al (13) reported that IL-12 suppresses RORc expression in human Th17 cell clones. Regarding the effect of IFN-β, Gautier et al. (38) have reported that IFNAR−/− mice had a decreased IL-12p35 accumulation, suggesting that endogenous IFN-β signaling mediates IL-12p35 expression. Consistent with these results, we report for the first time that in MS patients IFN-β-1a increases the expression of IL-12p35, an IL-12-specific component that binds to p40 to form a functional p70 heterodimer. While in agreement with previous reports we confirm that IFN-β-1a induces IL-12Rβ2 expression on T cells (22, 23), IL-12 did not play a critical role in the suppression of Th17 cell differentiation in our system, since IL-12 blockade did not reverse the inhibitory effect of SNs from IFN-β-1a-treated DCs on the Th17 cell differentiation (data not shown). Although the inhibitory effects of IL-27 on the Th17 cell differentiation (5, 25, 39, 40) have been established in mice, the role of IL-27 in the regulation of human Th17 cell differentiation was only recently implicated in the immunomodulatory mechanisms of simvastatin and IFN-β-1a in patients with MS (10, 18). Nagai et al. (41) have reported that IFN-β treatment of human DCs induces IL-27 gene expression, but its functional effect on the Th17 cell differentiation was not addressed. A recent animal study (28) proposed a pivotal role for IL-27 in the endogenous IFN-β-mediated suppression of EAE. In IFNAR−/− and TRIF−/− mice, an increased susceptibility to EAE was associated with reduced IL-27 production, while the administration of IL-27 suppressed the clinical disease activity, suggesting that the IFN-β-induced IL-27 expression is a critical mechanism for the immunoregulatory effect of IFN-β. We have demonstrated in this study that IFN-β-1a induces the expression of IL-27p28 in human DCs and that their transferred SNs inhibit Th17 cell differentiation, as assessed by the decreased IL-17A gene expression. To study the mechanisms involved in the IFN-β-1a-induced IL-27 gene expression, we examined whether the phosphorylation of STAT1, a transcription factor for IL-27 (5) that is induced by IFN-β-1a (20), mediates the IFN-β-1a-induced IL-27 gene expression. Our results confirmed that IFN-β-1a-induced IL-27 expression is mediated by the STAT1 phosphorylation, since it was inhibited by the STAT1-specific inhibitor FLUD. Furthermore, we report that IFN-β-1a treatment of naive CD4+CD45RA+ T cells in Th17-polarizing conditions leads to a decrease in the gene expression of the Th17 master regulatory transcription factor RORc, the cytokine IL-17A, and the Th17 cell surface marker IL-23R. The IFN-β-1a-mediated suppression of Th17 cell differentiation is also supported by decreased expression of the Th17 signature surface markers IL-23R and CCR6. IFN-β therapy-induced expression of IL-10 has been regarded as a hallmark of the therapeutic effect of IFN-β-1a in MS patients (2). In agreement with previous studies, we demonstrated that IFN-β-1a treatment of naive CD4+CD45RA+ T cells in Th17-polarizing conditions induces IL-10 gene expression and cytokine secretion. Studies of the mechanisms involved in IFN-β-1a’s direct inhibition of Th17 cell differentiation revealed that IFN-β-1a induces STAT1 and STAT3 phosphorylation in CD4+CD45RA+ cells cultured in Th17-polarizing conditions. According to the reports from animal studies (25), we propose that in the human system STAT1 phosphorylation directly inhibits Th17 cell differentiation, while STAT3 phosphorylation mediates the induction of IL-10, which subsequently inhibits Th17 cell expansion (24, 25, 39). In summary, our study has demonstrated that the therapeutic effect of IFN-β-1a in MS is associated with changes in the DC expression of cytokines that orchestrate Th17 cell differentiation. Furthermore, IFN-β-1a directly suppresses the differentiation of Th17 cells, as evidenced by down-regulation of RORc, IL-17A, and IL23R and induction of the IL-10 expression. Our study proposes a novel IFN-β-1a’s mechanism of action, which specifically targets the Th17 cell lineage and the development of the autoimmune response in MS.
After we had submitted our revised manuscript, Durelli et al. (42) reported that IFN-β-1a treatment decreases the frequency of IL-17-producing CD4+ cells in MS patients. Their results support our study, which further elucidates the IFN-β-1a mechanisms of action in DCs, previously identified (27) target for the IFN-β immunoregulatory effect against the Th17 cell-mediated autoimmune response. We thank Danielle Speer, Leslie Ingram, and Selena Spears for help with blood sample collection. ↵1 This study was supported by National Institutes of Health Grant K08 NS045871 and an Independent Medical Grant by EMD Serono Inc./Pfizer (to S.M.P.). A National MS Society Center Award (to S.M.P.) provided fellowship support for X.Z. ↵3 Abbreviations used in this paper: RR, relapsing-remitting; MS, multiple sclerosis; DC, dendritic cell; HC, healthy control; SOCS3, suppressor of cytokine signaling 3; SN, supernatant; RORc, retinoic acid-related orphan nuclear hormone receptor c; qRT-PCR, quantitative RT-PCR; FLUD, fludarabine; IFNAR, type I IFN receptor; EAE, experimental autoimmune encephalomyelitis. PRISMS. 1998. Randomised double-blind placebo-controlled study of interferon-β-1a in relapsing/remitting multiple Sclerosis. Lancet 352: 1498-1504. Byrnes, A. A., J. C. McArthur, C. L. Karp. 2002. Interferon-β therapy for multiple sclerosis induces reciprocal changes in interleukin-12 and interleukin-10 production. Ann. Neurol. 51: 165-174. Theofilopoulos, A. N., R. Baccala, B. Beutler, D. H. Kono. 2005. Type I interferons (α/β) in immunity and autoimmunity. Annu. Rev. Immunol. 23: 307-336. Amadi-Obi, A., C. R. Yu, X. Liu, R. M. Mahdi, G. L. Clarke, R. B. Nussenblatt, I. Gery, Y. S. Lee, C. E. Egwuagu. 2007. Th-17 cells contribute to uveitis and scleritis and are expanded by IL-2 and inhibited by IL-27/STAT-1. Nat. Med. 13: 711-718. Matusevicius, D., P. Kivisakk, B. He, N. Kostulas, V. Ozenci, S. Fredrikson, H. Link. 1999. Interleukin-17 mRNA expression in blood and CSF mononuclear cells is augmented in multiple sclerosis. Mult. Scler. 5: 101-104. Lock, C., G. Hermans, R. Pedotti, A. Brendolan, E. Schadt, H. Garren, A. Langer-Gould, S. Strober, B. Cannella, J. Allard, et al 2002. Gene-microarray analysis of multiple sclerosis lesions yields new targets validated in autoimmune encephalomyelitis. Nat. Med. 8: 451-453. Montes, M., X. Zhang, L. Berthelot, D. A. Laplaud, D. Brouard, J. Jin, D. Armao, V. Jewells, J. P. Soulillou, S. Markovic-Plese. 2009. Oligoclonal myelin-reactive T-cell infiltrates derived from multiple sclerosis lesions are enriched in Th17 cells. Clin. Immunol. 130: 133-144. Zhang, X., J. Jin, X. Peng, V. S. Ramgolam, S. Markovic-Plese. 2008. 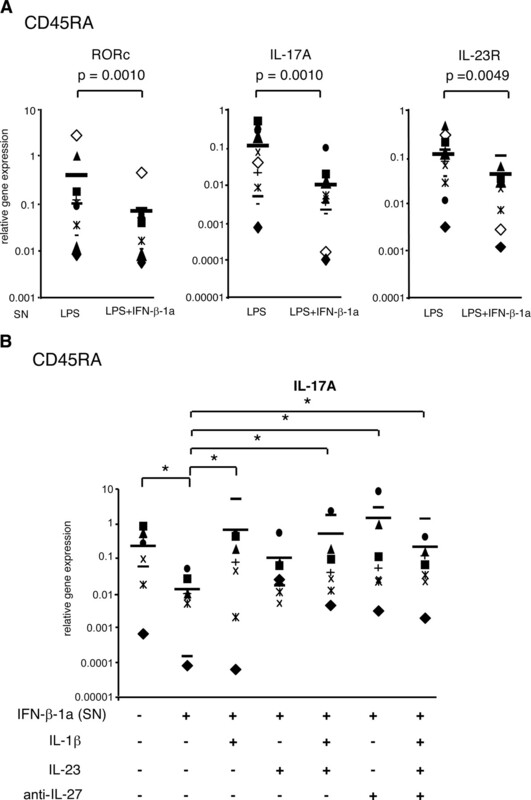 Simvastatin inhibits IL-17 secretion by targeting multiple IL-17-regulatory cytokines and by inhibiting the expression of IL-17 transcription factor RORc in CD4+ lymphocytes. J. Immunol. 180: 6988-6996. Acosta-Rodriguez, E. V., G. Napolitani, A. Lanzavecchia, F. Sallusto. 2007. Interleukin 1β and 6 but not transforming growth factor-β are essential for the differentiation of interleukin-17 producing human T helper cells. Nat. Immunol. 8: 942-949. Annunziato, F., L. Cosmi, V. Santarlasci, L. Maggi, F. Liotta, B. Mazzinghi, E. Parente, L. Fili, S. Ferri, F. Frosali, et al 2007. Phenotypic and functional features of human Th-17 cells. J. Exp. Med. 204: 1849-1861. Volpe, E., N. Servant, R. Zollinger, S. I. Bogiatzi, P. Hupé, E. Barillot, V. Soumelis. 2008. A critical function for transforming growth factor-β, interleukin 23 and proinflammatory cytokines in driving and modulating human TH-17 responses. Nat. Immunol. 9: 650-657. Yang, L., D. E. Anderson, C. Baecher-Allan, W. D. Hastings, E. Bettelli, M. Oukka, V. K. Kuchroo, D. A. Hafler. 2008. IL-21 and TGF-β are required for differentiation of human TH17 cells. Nature 454: 350-352. Manel, N., D. Unutmaz, D. R. Littman. 2008. The differentiation of human TH-17 cells requires transforming growth factor-β and induction of the nuclear receptor RORγt. Nat. Immunol. 9: 641-649. Zhang, X., Y. Tang, D. Sujkowska, J. Wang, V. S. Ramgolam, M. Sospedra, J. Adams, R. Martin, C. Pinilla, S. Markovic-Plese. 2008. Degenerate TCR recognition and dual DR2 restriction in auto-reactive T-cells: implications for the initiation of the autoimmune response in multiple sclerosis. Eur. J. Immunol. 38: 1297-1309. Zhang, X., J. Jin, Y. Tang, D. Speer, D. Sujkowska, S. Markovic-Plese. 2009. IFN-β-1a inhibits the secretion of Th17-polarizing cytokines in human dendritic cells via TLR7 up-regulation. J. Immunol. 182: 3928-3936. Krebs, D. L., D. J. Hilton. 2000. SOCS: physiological suppressors of cytokine signaling. J. Cell Sci. 113: 2813-2819. Qin, H., C. A. Wilson, S. J. Lee, E. N. Benveniste. 2006. IFN-β-induced SOCS1 negatively regulates CD40 gene expression in macrophages and microglia. FASEB J. 20: 985-987. Chen, Z., C. M. Tato, L. Muul, A. Laurence, J. J. O'Shea. 2007. Distinct regulation of interleukin-17 in human T helper lymphocytes. Arthritis Rheum. 56: 2936-2946. Wandinger, K. P., S. C. Stürzebecher, B. Bielekova, G. Detore, A. Rosenwald, L. M. Staudt, H. F. McFarland, R. Martin. 2001. Complex immunomodulatory effects of interferon-β in multiple sclerosis include the upregulation of T helper 1-associated marker genes. Ann. Neurol. 50: 349-357. Krakauer, M., P. S. Sorensen, M. Khademi, T. Olsson, F. Sellebjerg. 2006. Dynamic T-lymphocyte chemokine receptor expression induced by interferon-β therapy in multiple sclerosis. Scand. J. Immunol. 64: 155-163. Stumhofer, J. S., J. S. Silver, A. Laurence, P. M. Porrett, T. H. Turka, M. Ernst, S. J. Saris, J. J. O'Shea, C. A. Hunter. 2007. Interleukins 27 and 6 induce STAT3-mediated T cell production of interleukin 10. Nat. Immunol. 8: 1363-1371. Batten, M., J. Li, S. Yi, N. M. Kljavin, D. M. Danilenko, S. Lucas, J. Lee, F. J. de Sauvage, N. Ghilardi. 2006. Interleukin 27 limits autoimmune encephalomyelitis by suppressing the development of interleukin 17-producing T cells. Nat. Immunol. 7: 929-936. Teige, I., A. Treschow, A. Teige, R. Mattsson, V. Navikas, T. Leanderson, R. Holmdahl, S. Issazadeh-Navikas. 2003. IFN-β gene deletion leads to augmented and chronic demyelinating experimental autoimmune encephalomyelitis. J. Immunol. 170: 4776-4784. Prinz, M., H. Schmidt, A. Mildner, K. P. Knobeloch, U. K. Hanisch, J. Raasch, D. Merkler, C. Detje, I. Gutcher, J. Mages, et al 2008. Distinct and nonredundant in vivo functions of IFNAR on myeloid cells limit autoimmunity in the central nervous system. Immunity 28: 675-686. Guo, B., E. Y. Chang, G. Cheng. 2008. The type I IFN induction pathway constrains Th17-mediated autoimmune inflammation in mice. J. Clin. Invest. 118: 1680-1690. Vaknin-Dembinsky, A., K. Balashov, H. L. Weiner. 2006. IL-23 is increased in dendritic cells in multiple sclerosis and down-regulation of IL-23 by antisense oligos increases dendritic cell IL-10 production. J. Immunol. 176: 7768-7774. Chen, Y., C. L. Langrish, B. McKenzie, B. Joyce-Shaikh, J. S. Stumhofer, T. McClanahan, W. Blumenschein, T. Churakovsa, J. Low, L. Presta, et al 2006. Anti-IL-23 therapy inhibits multiple inflammatory pathways and ameliorates autoimmune encephalomyelitis. J. Clin. Invest. 116: 1317-1326. Krakauer, M., P. Sorensen, M. Khademi, T. Olsson, F. Sellebjerg. 2008. Increased IL-10 mRNA and IL-23 mRNA expression in multiple sclerosis: interferon-β treatment increases IL-10 mRNA expression while reducing IL-23 mRNA expression. Mult. Scler. 14: 622-630. Frobose, H., S. G. Ronn, P. E. Heding, H. Mendoza, P. Cohen, T. Mandrup-Poulsen, N. Billestrup. 2006. Suppressor of cytokine signaling-3 inhibits interleukin-1 signaling by targeting the TRAF-6/TAK1 complex. Mol. Endocrinol. 20: 1587-1596. Huang, Y., J. J. Feld, R. K. Sapp, S. Nanda, J. H. Lin, L. M. Blatt, M. W. Fried, K. Murthy, T. J. Liang. 2007. Defective hepatic response to interferon and activation of suppressor of cytokine signaling 3 in chronic hepatitis C. Gastroenterology 132: 733-744. Wong, P. K., B. A. Croker, K. O'Donnell, N. A. Sims, S. Drake, H. Kiu, E. J. McManus, W. S. Alexander, A. W. Roberts, I. P. Wicks. 2006. SOCS-3 negatively regulates innate and adaptive immune mechanisms in acute IL-1-dependent inflammatory arthritis. J. Clin. Invest. 116: 1571-1581. Li, Y., N. Chu, A. Rostami, G. X. Zhang. 2006. Dendritic cells transduced with SOCS-3 exhibit a tolerogenic/DC2 phenotype that directs type 2 Th cell differentiation in vitro and in vivo. J. Immunol. 177: 1679-1688. Zhang, G. X., B. Gran, S. Yu, J. Li, I. Siglienti, X. H. Chen, M. Kamoun, A. Rostami. 2003. Induction of experimental autoimmune encephalomyelitis in IL-12 receptor-β2-deficient mice: 12-responsiveness is not required in the pathogenesis of inflammatory demyelination in the central nervous system. J. Immunol. 170: 2153-2160. Gautier, G., M. Humbert, F. Deavieau, M. Scuiller, J. Hiscott, E. E. Bates, G. Trinchieri, G. Caux, P. Garrone. 2005. A type I interferon autocrine-paracrine loop is involved in Toll-like receptor-induced interleukin-12p70 secretion by dendritic cells. J. Exp. Med. 201: 1435-1446. Fitzgerald, D. C., B. Ciric, T. Touil, H. Harle, J. Grammatikopolou, J. Das Sarma, B. Gran, G. X. Zhang, A. Rostami. 2007. Suppressive effect of IL-27 on encephalitogenic Th17 cells and the effector phase of experimental autoimmune encephalomyelitis. J. Immunol. 179: 3268-3275. Yoshimura, T., T. A. , S. Hamano, Y. Miyazaki, I. Kinjyo, T. Ishibashi, A. Yoshimura, H. Yoshida. 2006. Two-sided roles of IL-27: induction of Th1 differentiation on naive CD4+ T cells versus suppression of proinflammatory cytokine production including IL-23-induced IL-17 on activated CD4+ T cells partially through STAT3-dependent mechanism. J. Immunol. 177: 5377-5385. Nagai, T., O. Devergne, T. F. Muller, D. L. Perkins, J. M. van Seventer, G. A. van Seventer. 2003. Timing of IFN-β exposure during human dendritic cell maturation and naive Th cell stimulation has contrasting effects on Th1 subset generation: a role for IFN-β-mediated regulation of IL-12 family cytokines and IL-18 in naive Th cell differentiation. J. Immunol. 171: 5233-5243. Durelli, L., L. Conti, M. Clerico, D. Boselli, G. Contessa, P. Ripellino, B. Ferrero, P. Eid, F. Novelli. 2009. T-helper 17 cells expand in multiple sclerosis and are inhibited by interferon-β. Ann. Neurol. 65: 499-509.